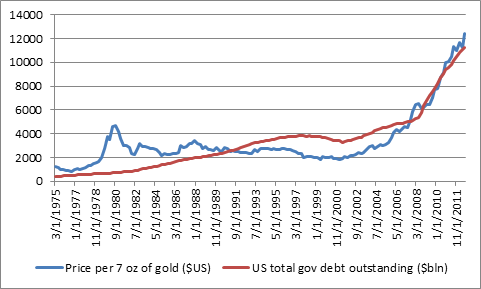 Startling Relationship Between Gold Price & U.S. Gov’t Debt Suggests What Price for Gold in 2017? So writes Eric Boughton in edited excerpts from his post* on SeekingAlpha.com entitled Gold And U.S. Government Debt: Highly Correlated. The current multiple of 6.37 is at a record distance (1.5 standard deviations) below the trendline ratio of 11.48. 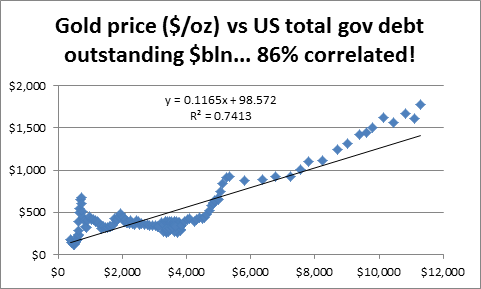 If the relationship [between US debt and the price of gold] returns to trend, then the gold price will “underperform” the change in US government debt from here forward. 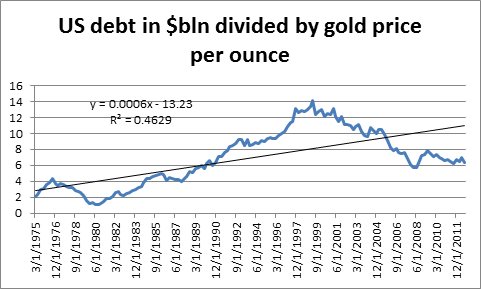 For example, if total debt goes to $17 trillion (from today’s $11.3 trillion) over the next 5 years, and the ratio goes to 12.57 (continuing on the same trendline), then the gold price would go back down to $1352 by the end of that 5-year period . 1. Gov’t Debt Will Keep Increasing Until the System Implodes! Are You Ready? 3. 2013: More Money-printing Leading to Accelerating Inflation, Rising Interest Rates & Then U.S. Debt Crisis! Got Gold? Since not many believe that Gov’t. debt will be reduced in any meaningful way, unless there is a sudden ADJUSTMENT GLOBALLY, it would then follow that PM (including Gold) will also keep increasing in value. The trick is not to be impatient or start second guessing yourself. As they used too say in the 60’s, relax and be happy, (that you have something to invest)!